There's this one face that scholars of Hillary Clinton's many expressions may recognize — and it's one that made an appearance more than once during Monday night's debate. 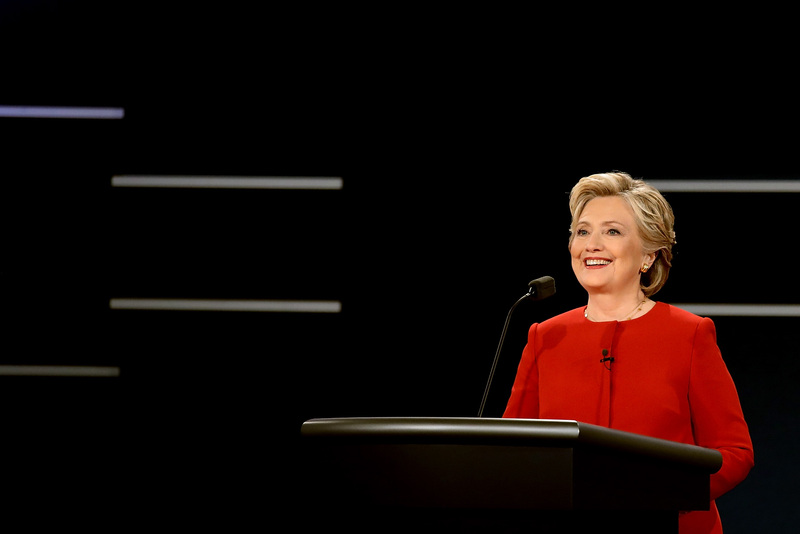 For a skilled and seasoned debater like Clinton, it's a face that shows she's in her element and a face that shows her opponent just made a huge mistake. Political cartoonist Ann Telnaes is also clearly intimately familiar with such a look — caught between a smirk, a laugh, and a soft smile —and captured it beautifully during the debate. It's an accomplished look, a pleased look, a somewhat-giddy look of someone who handed her opponent a shovel and let him dig himself deeper. Don't get me wrong: This isn't a "she looks better when she smiles" kind of deal — I'm decidedly anti-telling women how to use their face skin. However, it is a "she looks better when she's reaping the benefits of her hard work" kind of deal. She deserves to wear that face: one of satisfaction and a little bit of glee, especially after withstanding a barrage of insults (ranging from biting to baffling). Too often, comments about the way women use their face muscles go badly real quick — calling to mind an era when a woman's face (and her everything else, too) was meant to be as accommodating, pleasing, and inoffensive as possible. It doesn't matter if a woman is smiling too much or too little, there's pretty much a guarantee that somewhere a man will be poised to explain to her why she should be doing the opposite. But that's also why it's so redemptive and satisfying to see this smirky smirk on that stage — you gotta know it's a face that could launch a thousand douche-tastic dude think-pieces. Appreciating this smile is something different, too. It means appreciating a moment where a woman's reactions are wholly her own. She's earned, as the wonky weirdo who studied hard and came "over-prepared" to debate, at least a little bit of wiggle room to be a little bit smug, to recognize that she can trust her skills and knowledge. And, of course, it means appreciating what it means for a qualified woman to refuse to pretend she's on the same level as a grossly inadequate male counterpart, to "go high" when he finds innovative ways to go low. But the best thing about this expression? It's contagious.